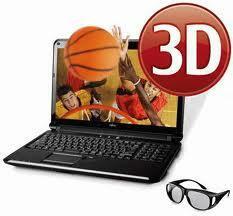 Fujitsu's new wide-screen Lifebook AH572 laptop does 3D (with glasses) and targets 3D movie and video buffs. While Nintendo's 3DS gaming device has hogged the 3D limelight of late, Fujitsu quietly began shipping its 3D-capable Lifebook AH572. This laptop's claim to fame is the dual function 15.6-inch widescreen display for both 2D and 3D (with 3D glasses) viewing. The Lifebook AH572 is now shipping for $999. Previously we've wondered whether 3D laptops and 3D smartphones were just gimmicks--and questioned the higher cost for both the hardware and media, as in pricey Nintendo 3DS games. But the Lifebook AH572 may actually make more sense, when you consider it's not really selling a niche 3D gaming experience-Fujitsu is touting the laptop's 3D movie and video capabilities. You can watch 3D movies on its widescreen display via the integrated Blu-Ray drive, wirelessly send movies to your HDTV, and record videos in 3D with its dual cameras. That said, even though 3D TV dominated this year's CES, the biggest problem with 3D displays is that most of them require 3D glasses-something the 3DS doesn't require but the Lifebook AH572 does. If you don't mind wearing the glasses, though, Fujitsu has also outfitted this laptop with some other nice specs, including a second-gen Intel Core i5 processor. The Lifebook AH572, which runs Windows 7 Home Premium, comes with: 4GB of memory, a 500GB 5400rpm drive, integrated Blu-ray combo drive, Intel Wireless Display technology, an HDMI port, a generous 5 USB ports, and a 6-cell battery that lasts nearly 8 hours (at least enough for a couple of 3D movies on one charge). The laptop weighs 6.7 pounds. One pair of 3D passive (requires no battery) glasses is included, but you can purchase additional pairs for $19. How easy it is to share the 3D viewing experience on the 15.6-inch display with others, however, is up in the air. Hungry for "a new dimension in mobile computing"? The Lifebook AH572 is shipping now from Fujitsu's online store.